Today’s Internet-based home automation technology gives one a unique kind of security. Fewer things in life are more appreciated than security — in this case, knowing (or at least feeling) that you’re more safe doing things a certain way or using certain devices. Wi-Fi cameras provide a look into your home from anywhere you have an Internet connection. Motion detectors keep you privy to any activity in your home. 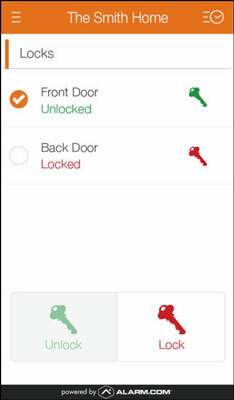 Smart locks and security apps, such as the one from alarm.com shown, allow you to lock and unlock your doors, no matter whether you’re home or visiting family halfway around the globe. When coupled with the use of door and window sensors, apps can alert you via text or email when someone enters your home uninvited. You can control lighting within your home from anywhere you have a connection to the Internet, making it appear to folks outside that someone is home. And these are just some of the things that Internet-enabled home automation systems and devices can do to help raise your level of personal and family security. Credit: Image courtesy of Alarm.com.